Rice has risen to become as much a part of the Italian eating tradition as pasta. Both the short- and long-grain varieties are utilised in some of the country's most famous recipes, whether as stand-alone dishes or accompaniments to plates of meat or fish. The introduction of rice into this part of the Mediterranean was the result of the merchant vessels that set sail from these southern waters. It is at heart a species of the grass family, and native to the sub-tropical climate of southern and Southeast Asia and Africa, grown in fields of shallow water known as paddies. The introduction of rice into the Italian diet came as ships returned from trading in these areas, probably around the time of the 15th century, and was quickly adopted and adapted in terms of growing methods. Because of its favoured climactic conditions, the chief area for rice growing was the northern part of the country around the banks of the river Po, which stretches from Piedmont in the west across to the eastern region of the Veneto. While other areas of the country have developed rice growing, such as Emilia Romagna and Tuscany, the Po valley remains the spiritual and most fertile area of cultivation. And not surprisingly it is the area where rice consumption is at its highest. Rice is synonymous with Italian cookery in the form of risotto, which is produced from the stubby, short-grain varieties. 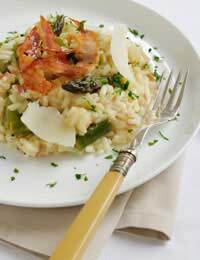 Risotto shares many similarities with the Spanish dish of paella, which claims Valencia as its standard bearer. This common bond is indicative of both the trading links between the two sets of seafaring peoples and the conquests and counter-conquests of the various kingdoms that fought for power in the region during the course of the 15th and 16th century. Today, rice production is an important part of the Italian economy, and the rapid rise in popularity of the Mediterranean diet, in part because of the claims made for its health benefits, means that the country's producers enjoy a great deal of success in the export market. However, the consumption of rice within Italy is small relative to that of pasta. In parts of the country such as the so-called mezzogiorno, namely the southern regions, it is still viewed as very much a northern dish.If any one city is going to claim rice as its own, it would be Milan, where the city's rich restaurant culture was responsible for the emergence of risotto alla Milanese, the name itself providing enough of an excuse for the proud south of the country to steer clear of anything reflecting an excessive amount of haughty northern civic pride. Nevertheless, the rice grain has made important inroads into the culinary traditions of the nation. Whether on the dining tables in countless households or in the salons of the smartest restaurants, its versatility has proved a valuable asset in winning the hearts and minds of people who value any staple that allows their creative juices the opportunity to flow.